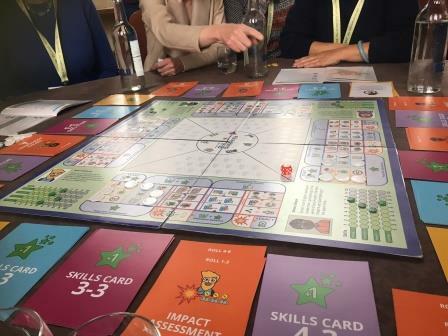 Cranfield University Blogs | Playing board games and making learning fun! At the end of May 2018, three of our Library staff presented at the annual DARTS6 conference (Discover Academic Research Training and Support) in Devon. An unexpected theme arose from the conference, that of using board games to support teaching and learning of research related topics such as open access, making an impact and copyright. Catherine Parker from the University of Huddersfield discussed the Game of Open Access that she and her colleagues had developed and all delegates were given the opportunity to play! We answered questions such as “The most cost-effective way of making an article open access is to place it in the University Repository – true or false?”. 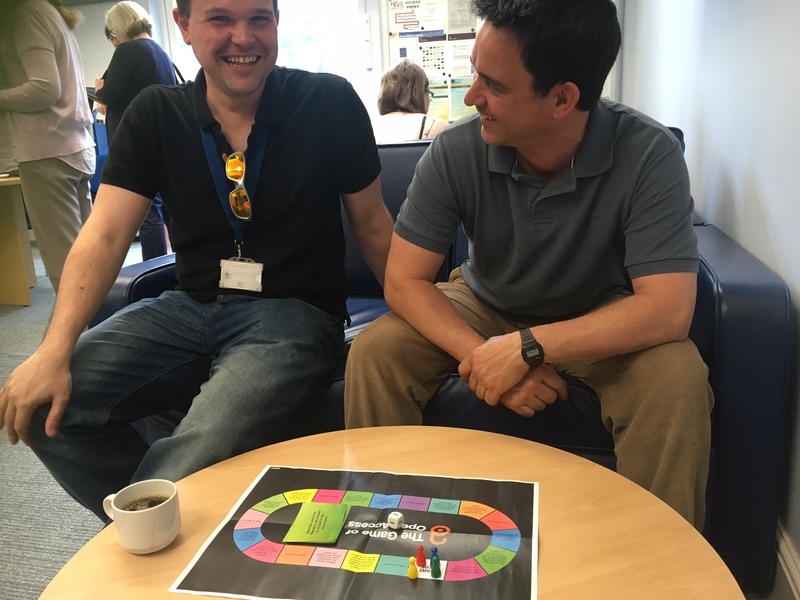 We were so impressed with the game that upon return we promptly downloaded it from the University of Huddersfield repository and took it along to the Open Access Coffee Mornings we ran at the Cranfield and Shrivenham sites in June. The game was well received and as you will see from the photograph above, learning about open access actually became fun! If you are interested to learn more, Catherine’s presentation can be viewed on SlideShare or you can talk to your Library’s Information Specialist. Jane Secker and Chris Morrison presented their Publishing Trap game, where you have the choice of being Misha the Criminologist, Brian the Microbiologist, Mary the Space Scientist or Simon the Jane Austen Expert! What more could you ask for? You are then taken on a journey of copyright literacy and scholarly publishing from early beginnings as a research student all the way through to Professor. Players are presented with a range of scenarios and have to make choices that may impact on, for example, their reputation or promotion prospects. These prompt discussions and sometimes debates between team members! There are wild cards which introduce unexpected events, all of which herald you to the end of the game, where you are finally judged on your academic legacy. No-one wants to die in obscurity, surely! Chris and Jane’s Publishing Trap slides can be accessed on Slideshare and you can also read a blog post about the game. Finally, our own Emma Turner and Georgina Parsons introduced Cranfield’s Impact Game to the DARTS delegates where it was well received and generated much interest. The game was also played and enjoyed by Cranfield researchers at both Open Access Coffee Mornings. If you would like to learn (and play!) more, please contact your Information Specialist and to whet your appetite further, read our recently published blog article.